Drilling a water well for your family’s use is one of the most important considerations when developing a rural residence. Regardless of the expense of the home and neighborhood, if you don’t have a good, reliable water system, everyday living is unpleasant. Arrow Drilling also installs holes for ground source heat pumps. 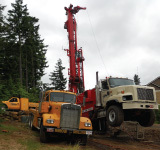 If you are considering a geothermal heating and cooling system utilizing closed loop, open loop or standing column wells, give us a call and we can help determine which type of system is best suited for your situation. 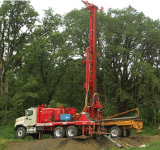 Call or email Arrow Drilling today and talk with John or Dawn Stadeli about your well needs. We believe you will find our dedication to your project is second to none. Please don’t hesitate to contact us to obtain a free estimate or site visit!